forum.rallyesim.fr - View topic - Problem with the links. Ici, tous les supports dont vous avez besoin ! Prenez le temps de lire avant de poster. Vous trouverez peut-être la solution à votre problème. Respectez toute personne apportant son aide bénévolement. Here, all the materials you need! Please read before posting. You may find the solution to your problem. Respect any person assisting voluntarily. Re: Problem with the links. The program called "dèpannage" doesn't work, because it says that I have 1.00 version and the program runs in the 1.2 version. Have you installed the updates 1 and 2? They are mandatory for the live. If I don't have 1.1 and 1.2 updates, I won't install the tracks? no? Si yo no tengo las actualizaciones 1.1 y 1.2, ¿no podré instalar los circuitos no? SI, mais sans les deux mises à jour, vous ne pouvez pas lancer l'utilitaire de dépannage qui est le seul outil qui nous permet de contrôler et réparer votre installation du jeu. Maintenant, si vous ne faites pas ce qu'on vous demande, pas la peine de demander de l'aide. If, but without the two updates, you cannot launch the troubleshooting utility is the only tool that allows us to monitor and repair your installation of the game. Now, if you do not do what asked you, not the penalty asking for help. SI, pero las dos actualizaciones, no se puede iniciar el solucionador de problemas, que es la única herramienta que nos permite monitorear y reparar la instalación de jeu.Maintenant, si no haces lo que te piden , no te molestes en pedir ayuda. I think, I discovered the problem. I installed the mod and the game in C:/Users. Obviously, I installed the two updates and ran the Dèpannages, and the Dèpannages showed an error message: the same as the other day: I have the 1.00 version and this runs win 1.20 version... all of this afther I installed 1.1 and 1.2 version, so the problem for me is the location. See the tutorial of uninstall and install. A few days ago, I rode a tutorial saying that the only wrong directory for install RBR and RSRBR is program files or program files x86, but not C/Users... bad tutorial. So... at this moment, I have to uninstall RBR, install RBR in another directory... C/Games/RBR... Documents/RBR? C/Downloads/RBR... and then install RSRBR 12', 1.1 update, 1.2 update, track packs... etc... no? And what's the best directory to install the mod and the game? Pas de support par MP. JE NE TRAVAILLE PAS POUR RALLYESIM QUAND UN MP ARRIVE !!! Le forum est le meilleur endroit pour obtenir de l'aide. Plus de personnes peuvent vous aider et les réponses peuvent aider d'autres pilotes. No support by PM. I'M NOT WORKING FOR RALLYESIM WHEN I RECEIVE A PM !!! Forum is the best place to get help. More poeple can help you and answer can be useful for everybody ! With RSRBR, it's important to create a new folder to put your RBR game... or some files can be blocked by Vista (or W7) security. @ Beu-C et obelix : petite incompréhension entre vous avec la barrière de la langue. Angliru parlait des patches 1.1 et 1.2 de RBR qui sont déjà dans RSRBR A moins qu'il se soit mal exprimé et confondu un peu tout. Je crois plutôt qu'il s'est emmêlé les pinceaux parce que, me doutant qu'il pouvait confondre avec les 2 patchs RBR, je lui ai donné le lien pour les 2 updates. So... I'm going to reinstall RBR. I enter in C/... I create a folder, called Games. I create a subfolder, called RBR, and I install RBR, no? And then, I install RSRBR, and the 2 updates, and I install all the packs and try to launch all. This will not fail , sure? Today, I'm going to install RBR and RSRBR. Maybe, if I have sufficent time, I will do the pack installation. If all the things are right, I will not have any problem. I want to test some different tracks, and continue with my project. Hi, I have a problem with my 2 accounts. 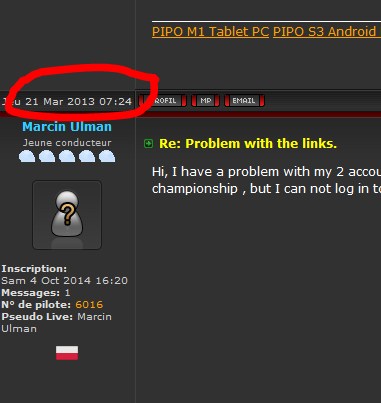 1 account Marcin Ulman I can log on to the website , but I can not participate in the championship in RSCENTER MENU. So I set up a new account Ulman MARCIN . On it I can drive a car in the championship , but I can not log in to the site. I write that the account does not exist. Please help me . You ask an old about two years which has no relation. You can not create two accounts (See the rules). This number does not exist. Registration 2014 is no longer valid. There is a subject reserved for recording problems.